Increasingly Australian dance companies are providing opportunities for their dancers to exercise their creative muscles by staging seasons of work by emerging choreographers. West Australian Ballet's Christopher Hill has choreographed a number of works in a professional context. A program like the company’s June “Genesis” season, a mixed bill of works by the company’s dancers, allows him to further develop his creative skills whilst continuing a performance career. Hill trained initially with his mother in Melbourne, then the Australian Ballet School and London Studio Centre. He danced with the Royal Ballet of Flanders in Belgium before joining the West Australian Ballet. He has choreographed works for both companies, and will be staging his 10th work this year. He has also designed sound and composed music for several film and stage works. When did you first start creating your own work? The first work I made was in 2013. It was in Belgium with the Royal Ballet of Flanders (RBF), the company I danced with. They had an in-house choreographic workshop, similar to WA Ballet’s “Genesis” program. I make music alongside my dancing and I’d been playing with the idea of creating something for a while, but I’d made a deal with myself that if I was going to make a work, I was going to also write my own music. So I made a four-and-a-half minute solo for myself with my own music. Had you ever experimented with choreography as a younger dancer? And what about musical composition? When did that start? I’ve been playing with music all of my life. . . This is a preview of an article by Nina Levy in the June/July issue of Dance Australia, in which she also talks to the Australian Ballet's Jill Ogai, who is choreographing her first work for the Australian Ballet's 'Verve' season, which runs from June 21 to 30 at the Arts Centre Melbourne. Read the full article! Buy the new issue at your favourite magazine retailer or purchase an online copy via the app subscribe here. 'Genesis' runs from June 26 to 30 at the WAB Centre in Maylands, Perth. For info and bookings, go here. 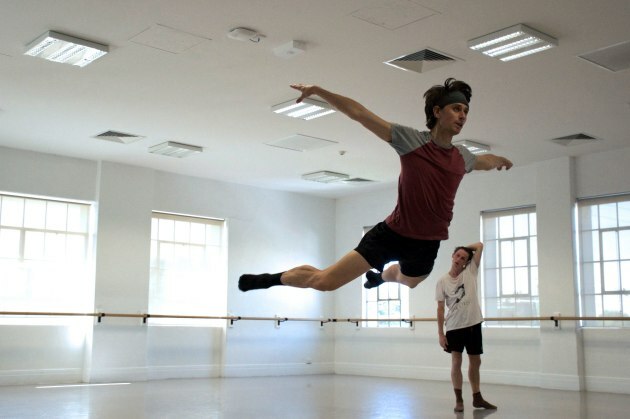 Photo shows Chris Hill rehearsing his ballet, 'The Clearest Light'. Photo by Tony Currie.